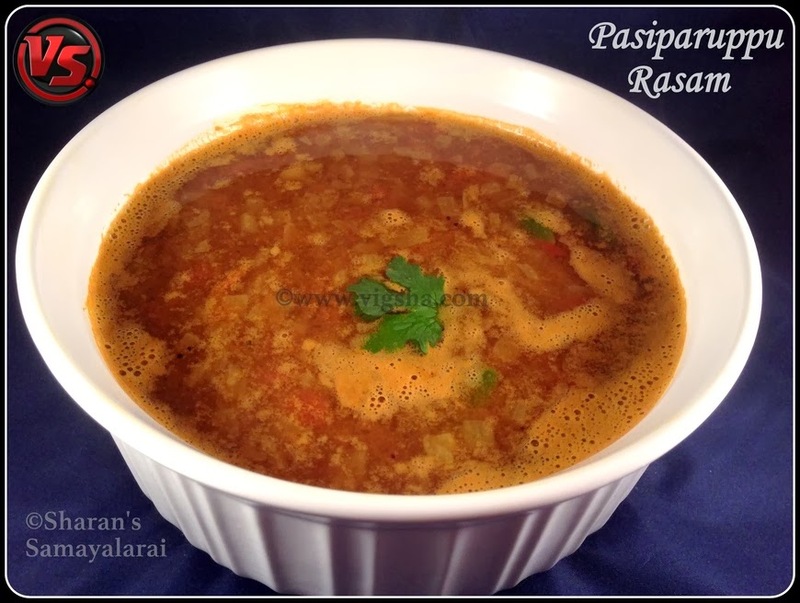 Pasi paruppu rasam is a simple, flavorful and an authentic recipe. 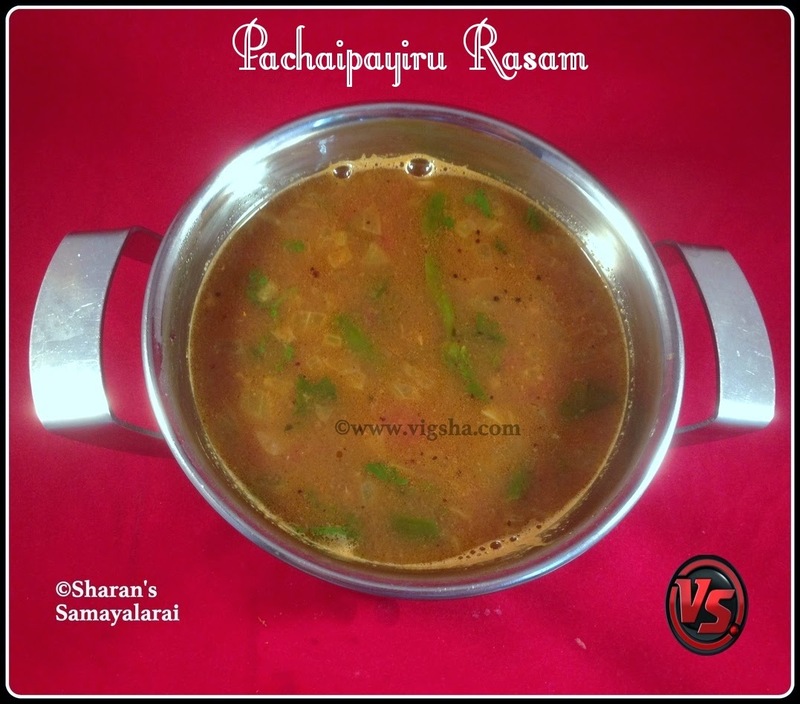 The flavor of the rasam depends on the dal used. 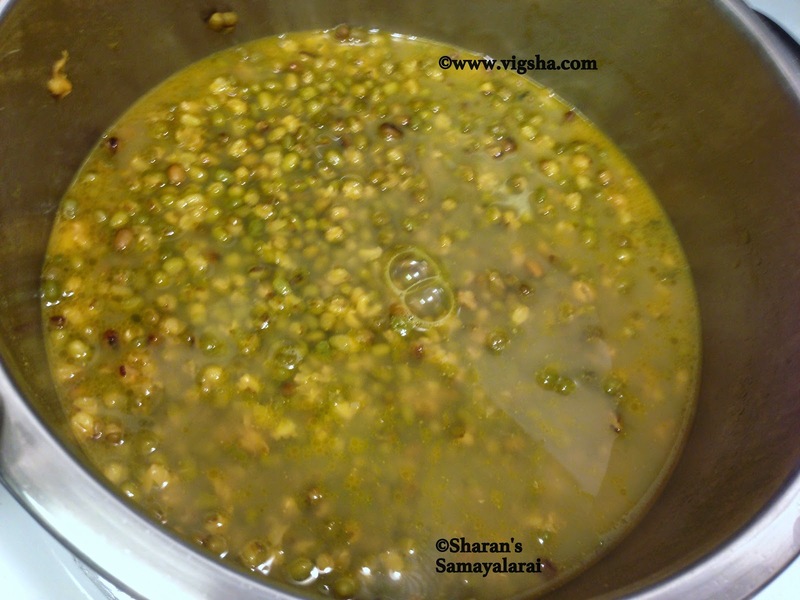 Today I am gonna post the recipe using whole-green-gram dal. Rasam is nothing but tangy Indian styled lentil soup, which aids in digestion and regulates metabolism. 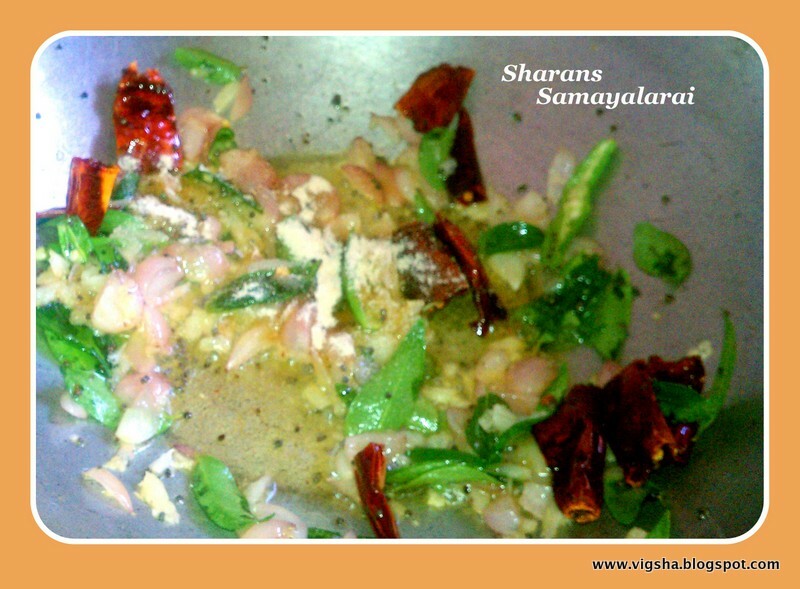 It is prepared with lentils, tomato, tamarind juice and rasam powder. 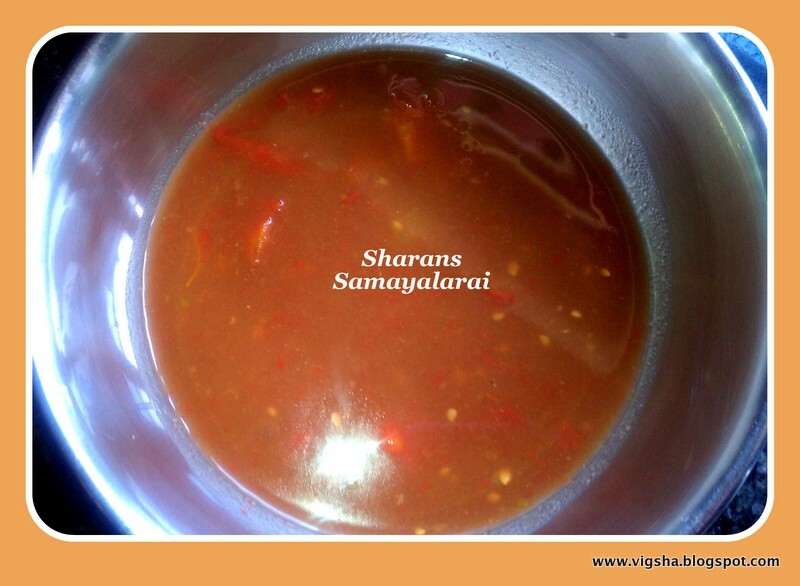 Rasam with vegetable stir-fry is one of the most comforting dish. 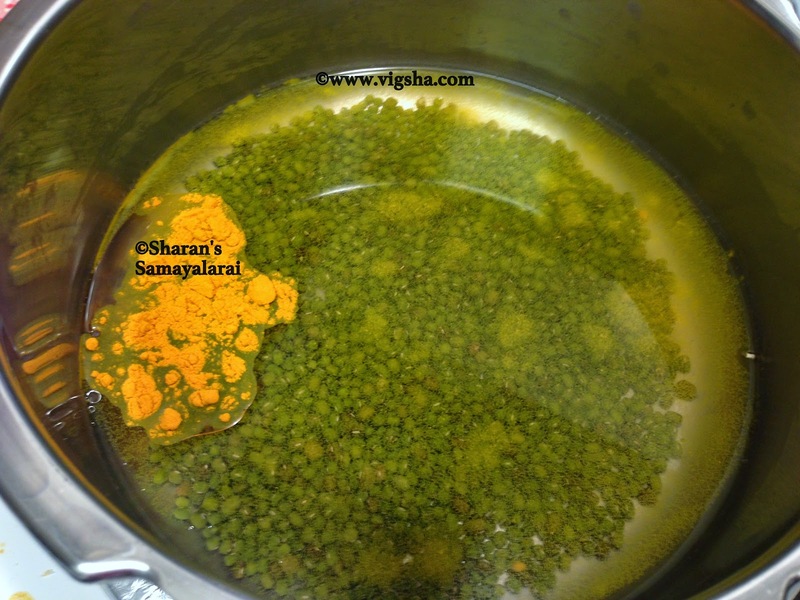 1) Wash green gram dal, pressure cook it with 3 cups of water, a pinch of turmeric powder and ¼tsp of castor oil. Leave it for 3-4 whistles. Once cooked, mash the dal along with the cooked water. 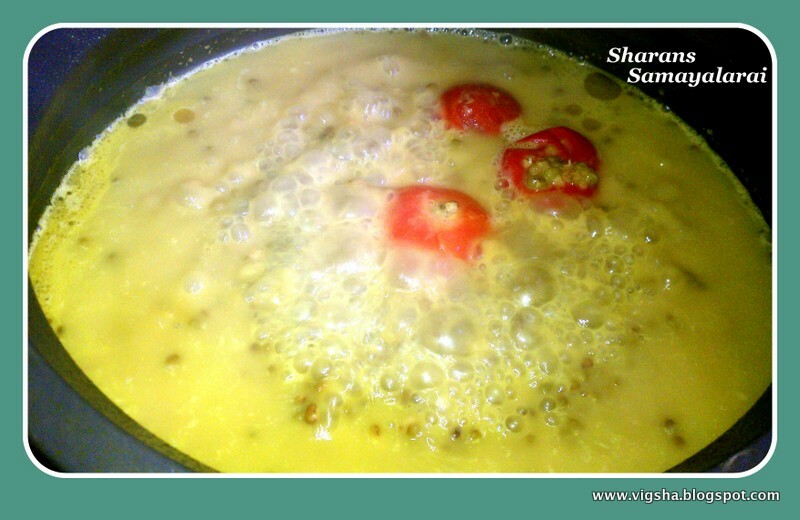 2) Add tomatoes to the dal mixture and let it boil for 5 more minutes or until the tomatoes becomes soggy. Switch off ! Drain the water for rasam and use the dal for preparing Masiyal. 3). Soak tamarind in ½ cup of hot water and extract the tamarind juice. 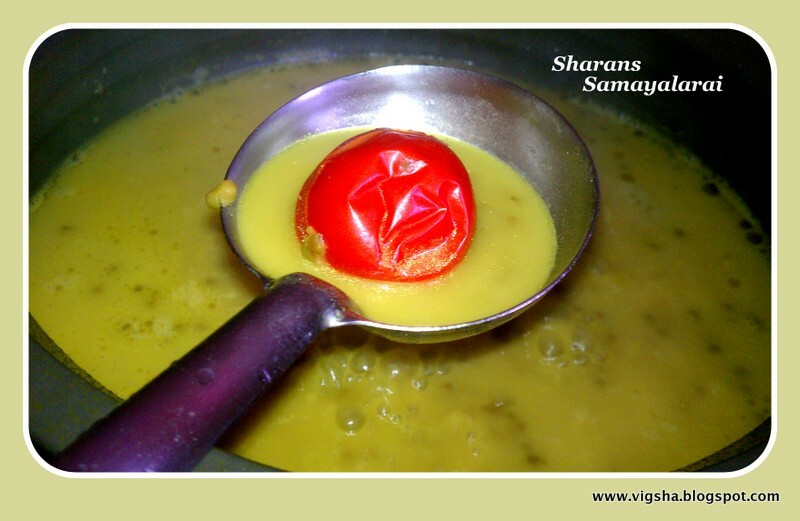 Take the boiled tomatoes from the dal mixture and add it to the tamarind juice. Squeeze the tomatoes and mix everything together. 4). Heat oil in the pan, add mustard seeds and let it splutter. 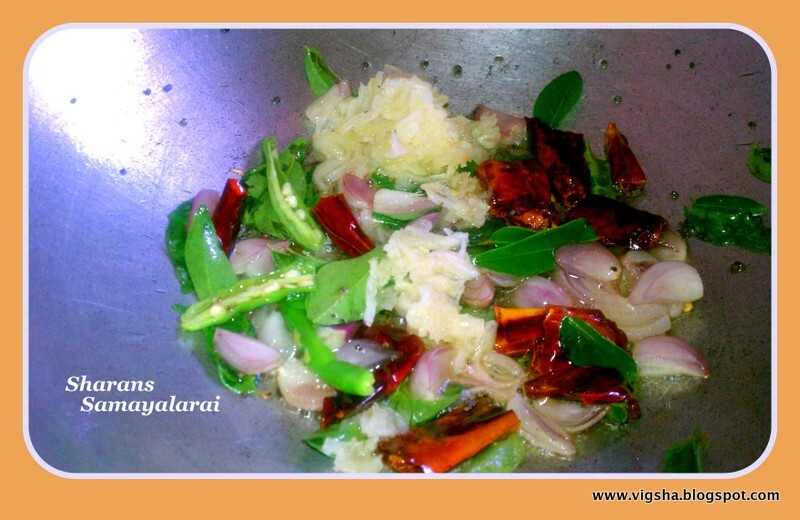 Then add onions, green & red chillies and curry leaves, saute till onions turn translucent. Then add the crushed garlic, hing, turmeric powder and saute for a minute. 5). Now add the tomato-tamarind water to the sauteed contents. 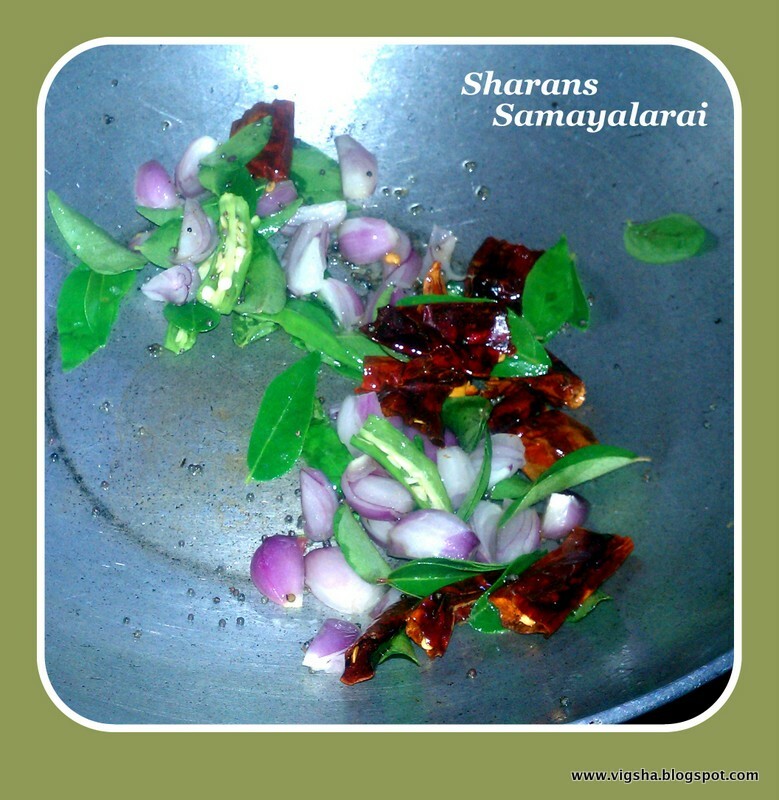 Then add rasam powder, turmeric powder and salt, mix well. 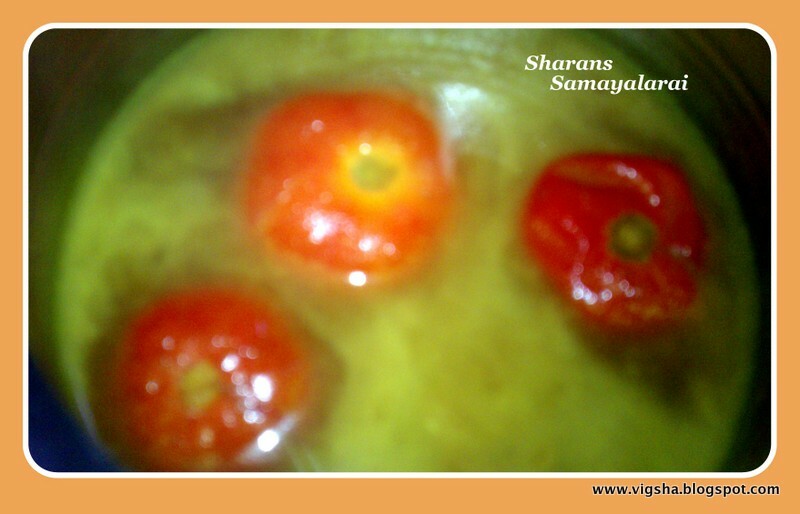 Boil until you see white foam or bubbles on the sides of the rasam. 6). Then add Dal water, grated coconut cook for a single boil and stop cooking immediately. Sprinkle finely chopped coriander leaves and transfer it to the serving bowl. Serve Rasam with a dallop of ghee and Steamed rice along with spicy vegetable stir-fry. # Care should be taken not to over boil. # Stir before serving, so that the dal mixes well. This rasam is meant not to be clear. So mix well before you serve each time. # Adjust the level of tamarind to suit your taste. Some tamarind may be tangier than the other types. 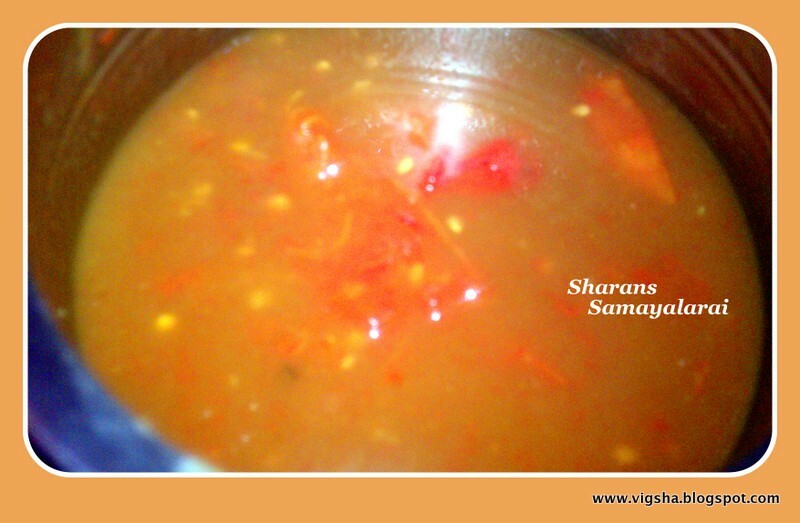 # If it becomes too tangy add some extra dal to the rasam and balance it off. 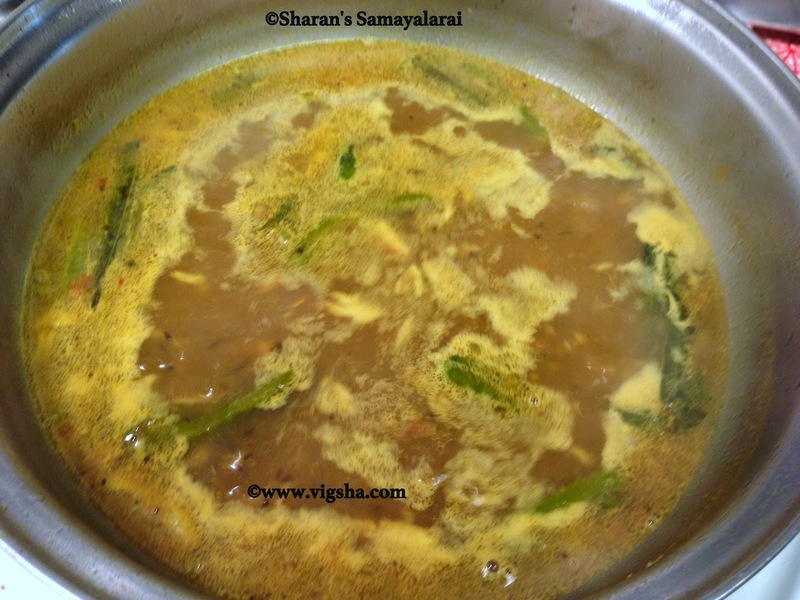 # After dal-water is added, don't give more than a single boil. Also dont over boil rasam as it will give a bitter taste. 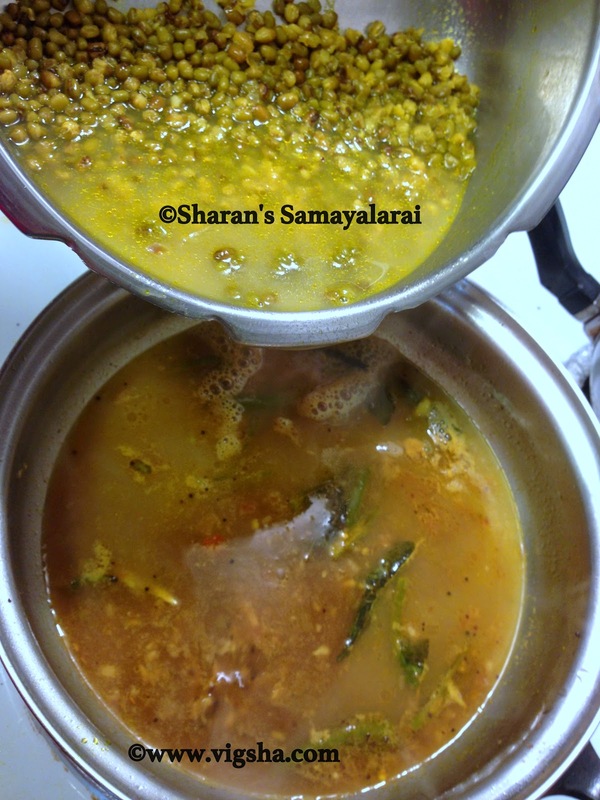 # You can cook more dal, reserve a handful of dal for rasam and use the remaining dal to make Pasipayiru Masiyal(Mashed Dal). 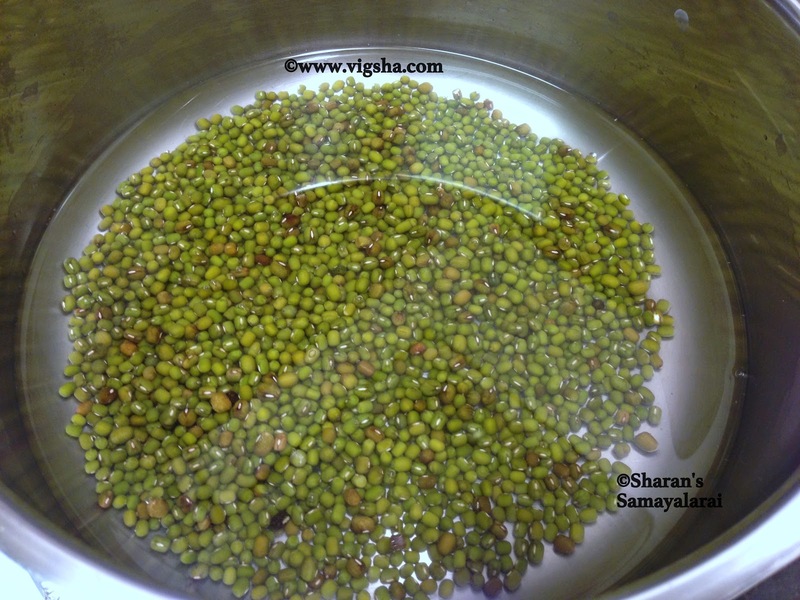 # You can substitute green gram with Toor dal(Thuvaram paruppu) or Horse gram(Kollu Paruppu). If you enjoy reading my blog, Join of my page on Facebook or follow me on Twitter. 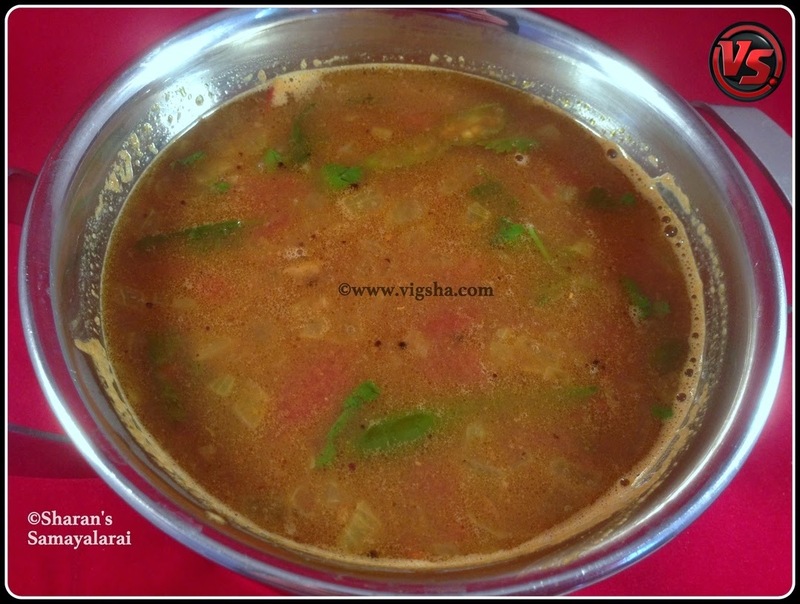 Delicious and comforting rasam.. One of my favorite. My comforting food,love it to the core.